Does your little girl live in sun suits all summer long? Do you love how adorable she looks with her halter ties and bubbly shorts? Then this might be for you! ***this post has been edited on 4/14/2016 and will link to the newly posted picture tutorial. For downloading the templates and chart you want to become a subscriber. DIY Crush is proud to be offering free sewing & craft patterns for our customers and blog readers! DIY Crush offers great sewing and craft patterns for sale for many crafting types, whether it be sewing, cross stitching, embroidery, quilting or others, but we also love to post about freebies! On April 15, 2015 we released our very first free sewing pattern, the ‘Fiji Sun Suit’ to everyone on our mailing list!! 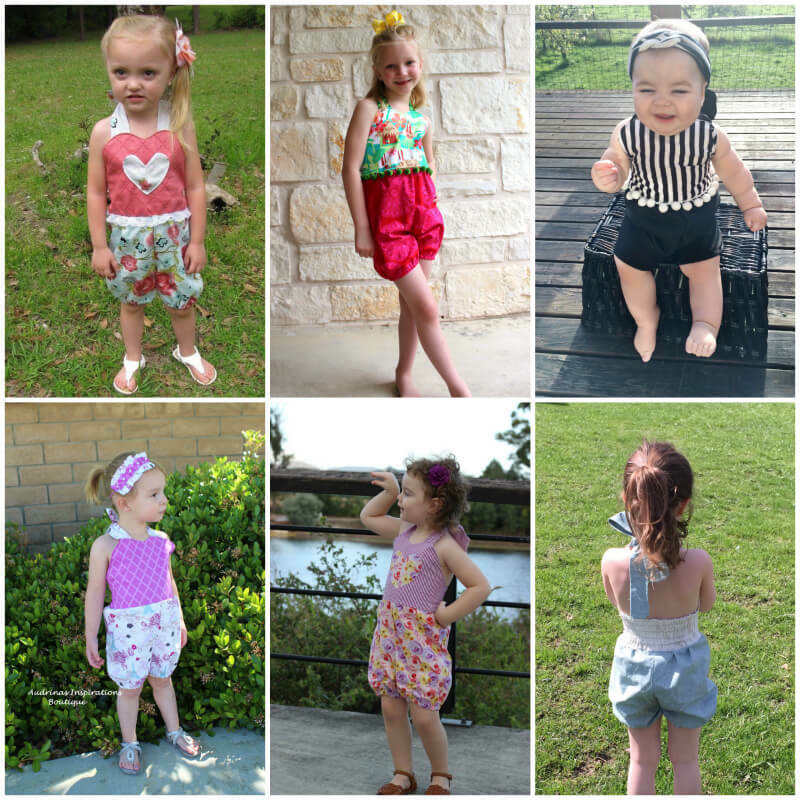 This free sun suit sewing pattern will not be available anywhere for sale. 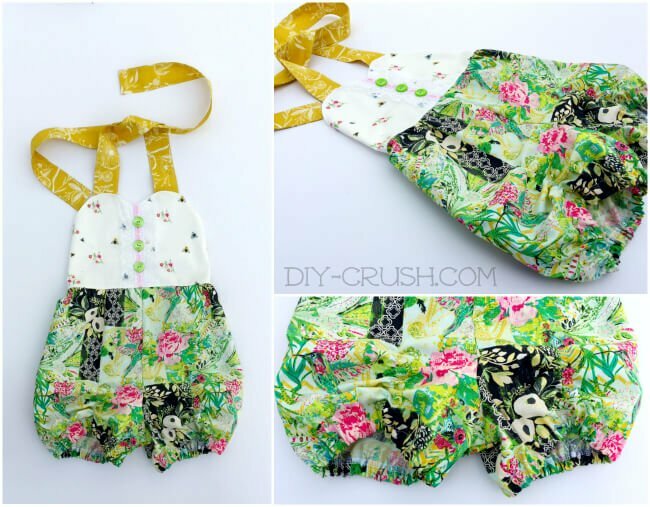 The free sun suit sewing pattern was designed by me with Whimsy Couture. It comes with templates and a sizing chart for 3 months through 6 girls and a video tutorial! If you like to see the picture tutorial (newly added) then visit THIS post, but videos are great for visual learners. The video is hosted on YouTube and you can pause whenever you need and scroll back if you need to read something again. The skill level for this pattern is beginner to intermediate, depending on if you are going to add the pompom trim and/or snap button tape. Both are optional features. How Will I Get This Pattern? The ‘Fiji Sun Suit Sewing Pattern’ is available HERE in a picture tutorial on the blog. How Long Is This Pattern Available For? I’m a new signee for the newsletter & I found your designs through a sewing group on facebook. I love several of your patterns & can’t wait to get them!!! Thank you so much for visiting!! So glad to have you read this blog! me poderia enviar por mi correos??? Gracias por suscribirse! El enlace libre patrón será enviado en el boletín de hoy! So adorable! I’m thinking my little girl needs me to make her one for our annual beach trip this summer! Thank you Katie! So happy you like it!! Hi Michele! Thank you for subscribing! The first newsletter went out 04/15/15. Two things could have happened, first is that it went into your spam folder (please check there) or something whacky happened during signup. Maybe you could try signing up again. But don’t worry, if you did not catch that one then you get more chances. The download links will be send out with the next newsletter in a few days! If you miss it then it’ll be in the next one and so on. This ends July 31, 2015. I signed up yesterday. Does that mean I won’t be able to download this adorable pattern until 15 May? It’s killing me to wait so long!!! Thank you for your interest in this free pattern! I checked and you are subscribed properly. You can try to unsubscribe and subscribe again so you will get a welcome email with the links. Please add support[at]diy-crush[dot]com (replace brackets with @ and .) to your email contacts. I cannot manually email you the pattern as I get tons of email requests. It’s all done via newsletter dispatching. Thanks for understanding! Super pattern! I love the fabrics you picked for sewing it. Thanks for sharing your project at the Inspiration Spotlight party! Hope to see you again soon. Pinned & shared. Thank you so much for visiting, Theresa!! Thank you also for pinning and sharing this post!! I can’t wait to stop by again soon! You can try to unsubscribe and subscribe again so you will get a welcome email with the links. I got the email, too. Just never got the link for the pattern. After signing up you will receive a welcome email which contains the download links. Please try unsubscribing and resubscribing. Hi, how do I unsubscribe so I can re-subscribe? I tried everything else and I keep getting back to the page about the sunsuit. Still nothing. I would even buy the pattern if it is offered for sale. Any advise on how to get the download? Thank you! Eileen, I hope you have received the latest newsletter which has the download link in it! It went out today May 22. We talked through facebook! 😉 Just replying to your comment for the record. I signed up but now how do I get the pattern? Thank you for subscribing! The latest newsletter went out today May 22nd and it has another download link for this pattern! Just signed up for your mailing list! Thank you for all the cute ideas and free pattern! Can’t wait to try it out! Thank you so much for visiting and signing up!! Happy sewing!! Thank you for signing up, Yasemin! A welcome email with the video and template links should have been sent to you. Happy sewing!! Hi, I just subscribed and the link to dropbox is giving me a 404 error that the file has been deleted? Thank you for subscribing!! it’s an automatic welcome email so I can’t edit it but the links to freebies will be in each new newsletter that is going out until the cut-off date for that particular pattern 😉 The next one will go out beginning of this week. Hi, i just found this awesome page and lost this pattern, i get another one, how can i get this BEAUTIFFUL pattern? i want it to make it for my doughter, please tell me there is another way, please please. Tks a lot. Thank you for your interest! This pattern was free for a certain time frame. I will be working on getting the tutorial written and offered in the next months.